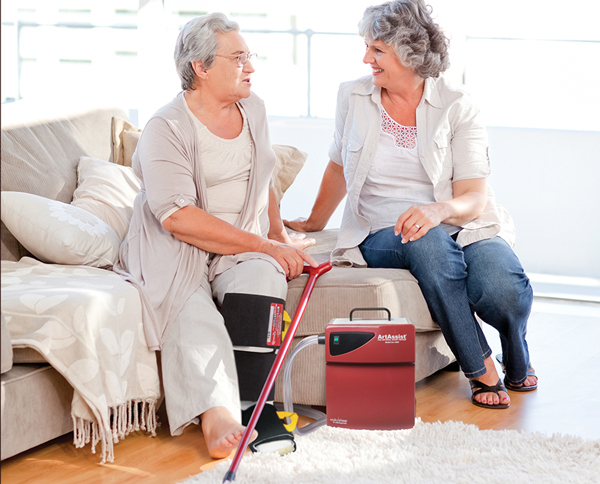 ArtAssist® is a home-use medical treatment designed to increase blood flow without surgery so that wounds can heal and patients can keep their limbs. Patients, families, and physicians are welcome to contact us to learn more. ArtAssist®…The Arterial Assist Device® was developed by vascular surgeons to increase arterial blood flow. It applies a unique compression sequence of 120 mmHg to the foot, ankle and calf with comfortable cuffs to circulate blood flow. 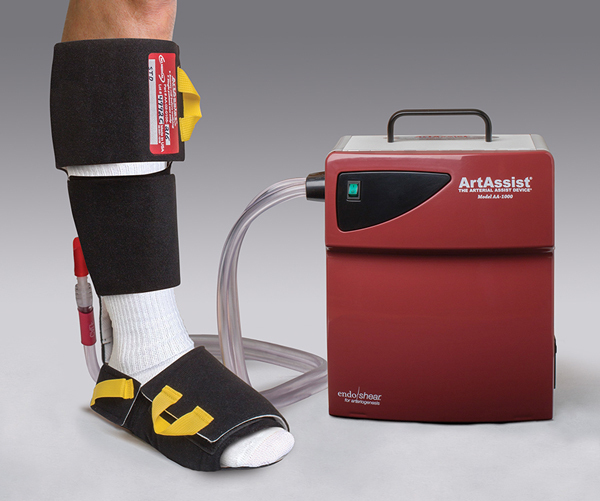 First, the ArtAssist® device compresses the foot and ankle. One second later, the calf is compressed. As a result, the foot, ankle and calf veins are almost completely emptied. In return, the arterial blood is more easily pushed down to the toes and blood-deprived tissues. Because of this mechanism, blood flow to the skin of the feet can be tripled. This compression regimen simulates the beneficial effects of brisk walking, without pain. A second mechanism of action that accounts for the large blood flow increase involves the endothelium (cells that comprise the lining of all blood vessels). Endothelial cells release important biochemical factors, such as nitric oxide (NO) that help circulate the blood. Since these biochemical factors dissipate after approximately 17 seconds, the device repeats the compression sequence three times per minute. This means that in a one-hour session, the patient’s arteries will be expanded almost 200 times. After at least 3 months of use, small vessels called “collaterals” may form (this process is also known as arteriogenesis), which provide long term blood flow improvements. Who is ArtAssist® therapy for? Who Should Not Use the ArtAssist® Device? The newest generation of the ArtAssist® device brings patients closer to long-term benefits because it is optimized for collateral artery growth. Compression and decompression rates now clock in at under 300 milliseconds, increasing shear stress to the endothelium. The ArtAssist® device with EndoShear™ technology for arteriogenesis is currently being phased in. This new technology is 510(k) FDA compliant and patent pending. ArtAssist®…The Arterial Assist Device® is a doctor prescribed therapy that takes place in the comfort of a patient’s own home. The pump and all accessories are shipped directly to the patient, including an instructional DVD. Telephone support is free. The device controller is portable and easy to use. Simply sit down, apply the cuffs, and turn it on. The ArtAssist® device will do the rest. The cuffs are made of soft, durable material designed to last for months of therapy. Recommended use is 3 hours daily, but prescribing physicians may change that. Patients should see positive results within the first month of therapy. When an ArtAssist® device is ordered from ACI Medical, patients typically rent it for an average of 3-6 months to give collateral arteries a chance to open. Once a patient has obtained results and therapy is completed, the pump with its accessories will be picked up and returned to ACI Medical with full support. The device may also be purchased, either from ACI Medical or from one of our trusted dealers.